Vlog Artifacts is an image generator that connects to YouTube and loads random segments of recently uploaded HD videos by self-described vloggers (video-bloggers). The project induces keyframe-dropping glitches while the video is decoding, and then algorithmically selects a still image from the outcome of this process. 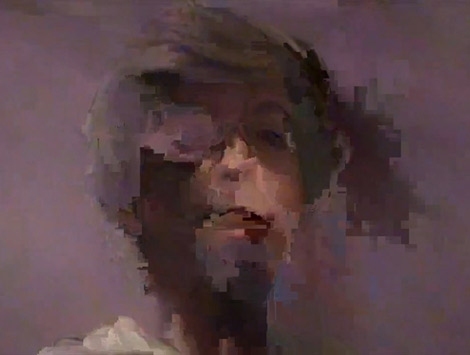 Due to the nature of H.264/MPEG-4 motion compression, which renders individual frames based on transformational info from other keyframes encoded in the video, the glitchy high-resolution snapshots often possess an almost painterly aesthetic. When the generator successfully causes a glitch by forcing the decoder to skip these keyframes, the image can often reflect distorted visual data that has bled over from previous times in the vlog. The end result is a series of artifactual portraits, capturing a mix of the vlog's intended subject and the technical means through which it was created.